Waza National Park is one of Cameroon's greatest assets for tourists; it is the country's most famous wildlife reserve and the most easily accessible one. 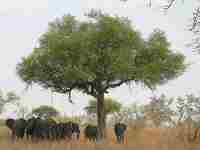 The park is in the Logone-et-Chari department in the far north of Cameroon. It is a UNESCO Biosphere Reserve and renowned for its wealth of wildlife. Visitors can expect to see elephants, giraffes, hippos, a variety of antelopes, monkeys and abundant birdlife, including ostriches. Although the park is known for its lions, the population has sadly been decimated by poachers, and although the majestic animals are still present they are now harder to find and sightings are considered lucky. The terrain of the park is mostly flat, made up of rolling plains and open savanna forests, meaning that it is great terrain for game viewing. The park is inaccessible during the rainy season and is usually open to visitors between 15 November and 15 June, although there is no guarantee that these exact dates will be adhered to. The best time to visit Waza National Park is between March and April, when the animals congregate around waterholes and are easily observed. There is no accommodation within the reserve, but there are camps right by the entrance and there is accommodation in the nearby village of Waza. Guides are compulsory within the park.